Order in the next 3 hours, 17 minutes an 46 seconds for same day shipping. Ideal for intensive use in business. There are many different applications for this self-inking rubber stamp with integrated ink pad. The larger sizes of this heavy-duty stamp are especially suitable for warehouse use, or as tabular stamps. The Professional 5274 has the dimensions of 57 x 37 mm and you can fit up to 9 lines of text. 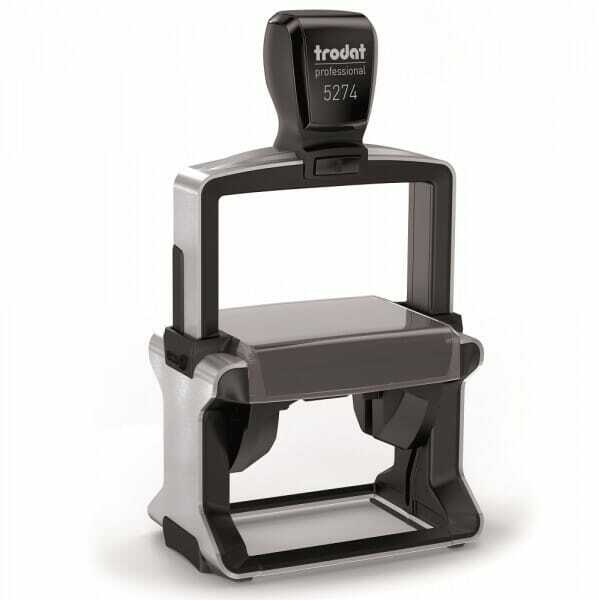 Trodat's self-inking textstamp features a new brushed stainless steel finish giving it a professional look while ensuring durability for heavy use. Customer evaluation for "Trodat Professional 5274 57 x 37 mm - 9 lines"